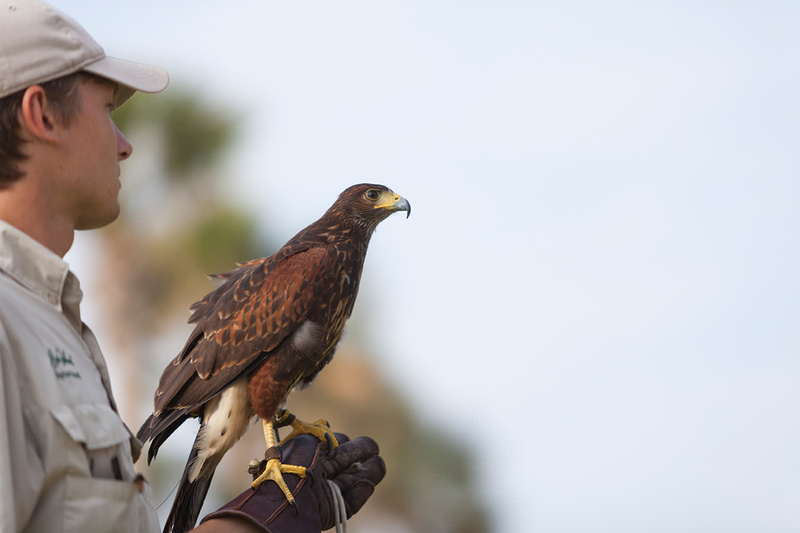 Chris Kennedy, a falconer at Sea Island’s Broadfield sporting club, leads hunts with Doyle, a 14-year-old male Harris hawk. Falconry, as Kennedy explains, is about convincing the bird that his goals and yours are aligned. Kennedy has been listening for subtle sounds of the tracking bell since he was 14. Doyle is one of six birds Kennedy uses to hunt on the estate. 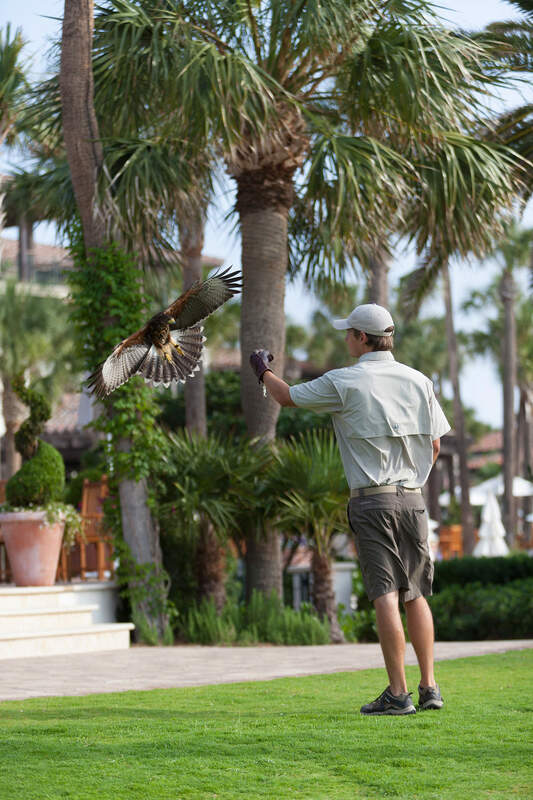 It’s another beautiful day at Broadfield, the 2,300-hectare sporting club at Sea Island resort in the south of Georgia, and Chris Kennedy, a master falconer there, is eyeing the trees. They’re live oaks dripping with Spanish moss, and they form a forest that’s cut by a narrow path—the path Kennedy walks along. Kennedy, a 28-year-old, is pensive. 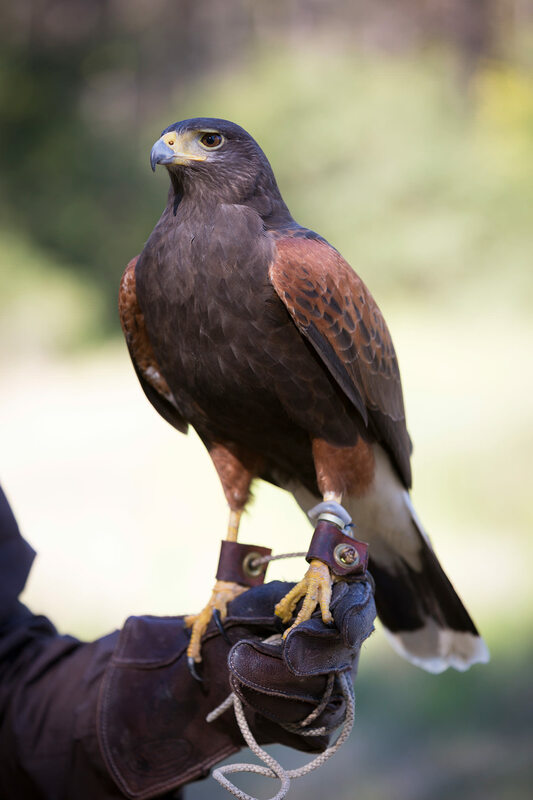 “Falconry,” he says, “is all about patience.” He pauses after a couple of steps to listen for the telltale dull tinker of the tracking bell that’s strapped to the leg of Doyle, a 14-year-old male Harris hawk and one of the six birds he uses to hunt on the estate. We watch as Doyle wonkily flies from his perch high up in an oak tree to another hundred or so metres away. Hawks soar gracefully but flap silly-like. Soon, though, Doyle is perched again, and we continue to walk, hoping to scuff up a squirrel or a rabbit. “Patience,” repeats Kennedy. 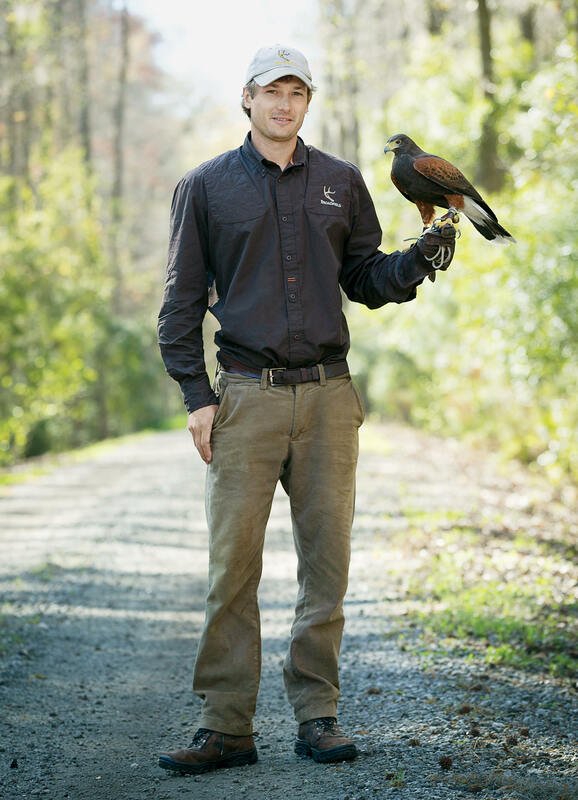 Kennedy is one of the few full-time falconers in the United States. (At Sea Island guests can accompany Kennedy on a hunt.) Falconry, one of the oldest forms of hunting in the world, isn’t dying out, but it’s not exactly flourishing either. From Mongols in 4000 BC to medieval English lords to Russian czars (back when they had them), the technology of falconry—man, bird, prey—is rudimentary and unchanged. But you’re much more likely to happen across a man in silly expensive camouflage with a Beretta across his lap and chew in his mouth than you are a falconer. To that end, Kennedy carries a pouch full of raw quail meat. With a staccato whistle, Kennedy summons Doyle from the trees to his gloved hand. The bird’s eyes stare at Kennedy unblinkingly, expectantly, as the bird’s talons, which can crush a squirrel to death, rest gently on the leather. With his other hand, Kennedy reaches into his satchel and feeds the bird a sliver of raw meat. If Doyle’s eyes were to fasten upon a rabbit darting or a squirrel fleeing, he would tumble headlong toward it, weaving between trees and cracking boughs, reckless and tenaciously aggressive in his pursuit. But when he reaches his quarry and takes it, as hawks do, to the ground, Kennedy will slowly approach, swiftly swap out the dead squirrel for a prepared cut of meat, and walk away. As it happens, Doyle doesn’t find what he’s looking for, but that seems just fine with Kennedy. He summons Doyle back to his hand and strolls again through the trees. “Well, maybe next time,” he says. Photos provided by Sea Island.